Generation X is in deep trouble if this is the best case they can make for themselves. Bagby, a law student and economist who appears regularly on CNN’s Financial News Network, vigorously defends her generation. In her view, putdowns such as the “slacker” label commonly aimed at Generation X are media stereotypes created to characterize a phenomenon older generations don’t understand. The world has changed and today’s youth and young adults are responding to different imperatives and therefore have a different outlook than their parents. Unfortunately, in addition to an overview of the utterly predictable ways in which Generation X will increasingly come to dominate American society—time will march on—her book reinforces these stereotypes as much as it dispels them. Consider: Bagby sees her cohort group as diverse, complex, and not easy to pigeonhole, yet in embracing the language of “us” and “we,” she paints her generation in more monolithic terms than any critic. Continually harping on the problems they face ends up looking preposterous, as if, for example, not having an event like the Vietnam War to shape group identity is a disadvantage. Believing they have gone beyond ideology to look for what “works” without noticing that the “end of ideology” was declared by some scholars as as far back as the ’60s suggests a group identification based as much on failing to learn from the past as on new realities. 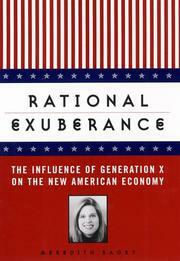 Contrasting individual success stories with evidence of her cohort group’s amazing political apathy in the face of policies diametrically opposed to their short- and long-term interests inspires Bagby to draw positive conclusions about her generation, displaying a contorted logic in which anecdotal evidence is given more weight than general behavior. Gen-Xers will mo doubt like this book and shake their heads at the ignorance of critics who find it simply self-indulgent.